Are you on the verge of forcefully being evicted from your apartment because you couldn’t pay your rent? Living on a tight budget has its ups and downs. A little financial crisis can throw you off balance. Especially when you need help paying rent before you get evicted. During this time, your thinking cap is set, and you are on the lookout for the best ways to overcome such financial crisis. Suddenly you lose your job. As if that is not enough, you are now on the verge of losing an important aspect of your daily living – shelter. If you live alone and you always find yourself spending more than your monthly income, you could be closer to homelessness than you think. Even if you are a two-income earning family. If you don’t have a huge saving plan, eviction could knock on the door anytime it sees an opportunity. A lot of families in the U.S live from paycheck to paycheck. Without considering the need to have a savings plan as a safety parachute when the stormy times begin; this causes problems. Although families usually have more grace period as they could be entitled to months to live off in the case of an eviction emergency. But that is the best they can get. The financial status of most families is such that if the stove goes bad, all savings could be injected into replacing it. And hence, they are gone. Just imagine if one of the earner’s losses a job at such a time, then the tension will only increase as it implies minor savings. Before both earners realize, they are already finding it difficult to pay for rent, and an eviction comes knocking on their door. The above scenario describes a typical homeless formula of an individual or family living in a rented apartment. A notice to leave a property with immediate effect or risk eviction is devastating. And it mostly stems out from mishaps such as a job loss, debt, hospital bills or even an addiction. In circumstances whereby you can’t afford to pay your rent as it became due, can be a terrifying problem. Most rental agreements have little or no grace periods. If you default, you may risk getting evicted. Do you need help paying rent before you get evicted? For many people, the simple answer to that question is YES! This option might be a difficult one for you, but you might be surprised to see how fast it works. Your landlord might be willing to work with you especially if you have been paying your rent on time until now. 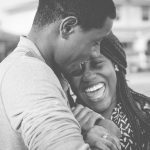 When you discuss with him, ensure you express your feelings about the situation. Ask him if he could give you more grace period? Better still, provide a plan that could benefit the both of you. When he sees that he stands to gain something financially, he might decide to work with you on the game plan. Somewhere out there, there is someone desperately in need of shelter. Who has the necessary rent payment but does not know where to begin his search for an apartment. Such a person could be of tremendous help to you especially when you are on the verge of being evicted from your rented house. You could collect his funds and quickly use it to pay for your rent bill while you accommodate him as a roommate. This can really help when you need help paying rent before you get evicted. You could decide to apply for a loan in your local bank to quickly settle your rent bill before you are thrown out. Most banks will require you to have a good credit rating and a reliable source of income. When that is settled. You are in. However, remember you will have to make small payments from your monthly income to settle your loan in installments. Therefore, avoid applying for a loan if you are not sure of paying it back or keeping your part of the signed loan agreement. If you do, you might find yourself in a situation far worse than the financial mess that made you sought for a loan. In situations like this when you need help paying rent before you get evicted, there are answers. Many charities offer one-time grants that also cover rent as well. The amount of grant you are eligible to will depend on your situation and the charity’s grant limits. One unique thing about such grants is that you are not required to pay back. Such grants include The Salvation Army, Modest needs, Catholic Charities and local charities. Depending on the state you live in, you may be eligible for its long-term assistance. They are simply programs that help you to pay for rent or help you find a better place to live. Such assistance can last up to several months. This time, you have to search your mind. There are friends and family members that could be of great help in these trying times. Perhaps, you haven’t seen or heard from them for a long time. don’t you think it is time you give them a call? Most times, help comes from sources we least expected. A close friend or a family member could offer help or even lend you some money to sort your rent out before paying back. This is the worse mistake people who are on the verge of becoming homeless make. They wait for the last dying minute when they are about to be thrown out before trying to get help. It’s vital to ask for help on time while it is still available and from reliable sources as well. If you have a plan B option for raising some funds to pay your rent, then don’t wait till it expires before doing it. This is because it might take some time to yield results and by then you might have been evicted. So hurry while there is still enough time. One significant step you ought to take is to know where you stand financially. This implies that you should have a rough estimate of your expected income and expenses on a monthly basis. This is helpful in situations whereby you usually expect your monthly income to skyrocket at a particular time of the year with the same level of monthly expenses. You could then plan your budget to ensure you can pay your rent from the expected income increase before the grace period elapse. Most states in the United States have several programs with the purpose of helping people who are already facing the danger of being evicted. Such programs include the Homelessness Prevention Program (HPP) and the Emergency Assistance (EA) Program. However, the EA is only eligible to people who receive Supplemental Security Income (SSI) or welfare. As for the HPP, it is eligible to people that are receiving disability or unemployment. 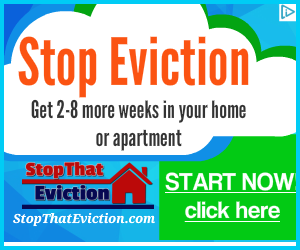 Aside from the popular state sponsored stop eviction programs, other smaller rental assistance programs in your state can help you to pay back your rent for you to avoid an eviction. A lump sum of money is budgeted annually and kept in the custody of a Comprehensive Emergency Assistance System (CEAS) in each state. The committee set up CEAS then disburses the funds to local agencies in every region of the state. The money is then spent by the local agencies to help people who are facing the risk of eviction sooner or later. These are really “stop homelessness” programs in larger states. Not all states have these programs and they are somewhat hard to qualify for. But, they are available if you pursue them. 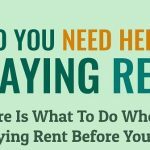 The list in this article combined with the material on the Getting Help Paying Rent ASAP page will get you a long way toward solving this problem. Time is of the essence. Act quickly and always be ready with Plan B…or maybe even Plan C or D.
PREVIOUS Previous post: Do You Need Help Paying Rent ASAP?